Over 20 Locations in Dewey Beach AND Rehoboth Beach In 2015 we expanded this amazing event to (2) days. Making this an all weekend Bacon Blowout!! Enjoy amazing bacon creations from over 20 awesome locations & counting. Some locations will run out of samples.. That's okay move on to the next location on your map. This is a 2 day event.. Rehoboth Beach will have more samples than Dewey Beach. Spend the weekend at the beach. Friday... Welcome Party @ The Rusty Rudder 6pm-9pm, Check out Dewey and Rehoboth Beach. Stop by participating locations for happy hour & dinner specials. 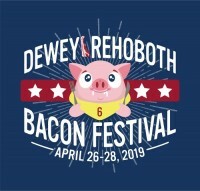 Sunday... Rehoboth Beach Bacon Fest. Sunday Afternoon... Best Bacon On The Beach Awards Ceremony at The Starboard! That's a killer weekend at the beach. For the love of BACON do not miss this event!